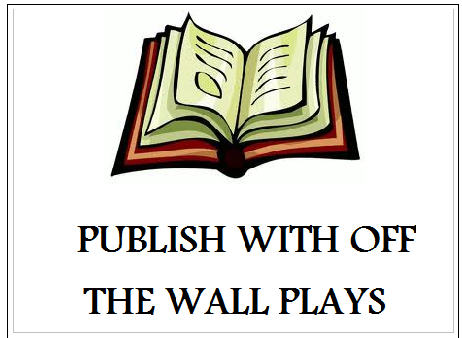 WELCOME TO OFF THE WALL PLAYS – online play publishers. Submit Your Script today. Off The Wall Plays is a young, online publishing house whose aim is to attract quality playwrights with fresh, new ideas as opposed to our larger competitors. We accept your plays free of charge. Off The Wall Plays will publish your play and get it out there for you. If your play sells, you will get 80% of the Royalties of each sale from the beginning. Because Off The Wall Plays is a smaller publishing house, we have the resources and time it needs to get your play out there. We put a synopsis and sample of your your play on the front page of the website, when your play goes live, so it gets seen and not just filed into a genre with thousands of other plays. It stays in our top ten new plays for the next few months.We place a sample of your script on the website, not the full play so no one will be able to illegally use your work. If your play sells well, we will add it to our “Best Sellers” list, automatically ranking it higher than ordinary plays, the price increases, and so do your Royalties. Plays bought to be used for a run or a season will also have license fees that will be paid by the organization that purchased the play, and 50% of those will go to the authors as well. Once your play has been submitted, your play will be reviewed by our editor, who will contact you. Please have a look at our guidelines for submitting your play – by following these guidelines it will help your play sell. We don’t mind correcting the odd typo, but plays with many spelling mistakes, missing punctuation marks and poor grammar will be sent back to the authors for correction before they can be considered for publishing, so please make sure yours is 100% first before you send it! We also try to get back to authors within a few days at most so they will know almost immediately that their script has been received and whether or not it will be published. Force creates pressure and pressure creates counter- pressure. The result? A blowout. The Pump Room is a drama about the intersection of the criminal and political worlds, the sexual and the ideological. It is a play about the South African reality of the late 1990s, but one which applies to many other societies that have experienced epochs in their history when, after a long period of oppression, a new period struggles to resolve the past and deal with fresh challenges. The central event that drives the play is the murder of a ‘postman’ carrying drugs. Over several hours on a hot summer’s night, the consequences of this action cause a number of inter-connected people to meet in the pump room of a public swimming pool in Cape Town. These disparate characters play out the tensions and contradictions of their pasts and presents, and a complex web of relationships emerges. It has been performed at the Windybrow Theatre in Johannesburg, South Africa in 2010 and the the Theatre in the District in Cape Town, South Africa, in 2011. Ages of actors: most in 40’s, 2 in 20’s, 1 in 30s.